Every person has his or her own understanding of what pain is, the contributing factors leading to the cause of pain, at what degree of pain does a person seek help and where does a person go for help? Since there are only 30% of pain cells in person’s body it takes a problem at least 70% to develop before a person feels pain. It could take 10-20-30 years before a person has back, leg, neck, arm pain. It also means that if a person is a workaholic and has a high tolerance for pain that individual may not experience the pain until the problem has reached a level of 8 or 9 on a pain scale of 10 (10 being unbearable). Getting chiropractically examined and having x-rays of your back or neck taken earlier in life can help you see the direction that your spinal well-being or disaster is heading. You can become pro-active in your behalf. You don’t have to be dependent on addictive pain medications, or over-the-counter pain relievers and surgery. You can receive gentle, non-invasive, non-surgical help to relieve back, leg, neck, arm pain whether you are suffering from a bulging, herniated, prolapsed, sequestered disc, facet syndrome, sciatica or stenosis. MRIs, x-rays, a thorough spinal examination and evaluation with a CBC (Complete Blood Count) and urinalysis can help Dr. Bob understand better the factors leading to your level of pain or injury. Don’t be mislead by some clinics offering one or two free spinal decompression treatments. Their purpose is to have you experience the spinal decompression. It can and probably will help you, but with subsequent treatments you’ll just be one of many on an assembly line and not receiving the personal care and attention that your condition requires and the personal attentiveness that you would prefer. Our clinic doesn’t pressure you to sign a $5,000 contact for your spinal decompression sessions. Instead if you could bring to your initial consultation your current x-rays, MRI’s and any medical reports that you have, and if you are genuinely seeking help Dr. Bob would extend to you a complimentary consultation, evaluation, examination. This would allow you to experience our office environment, and our personal attention and professional care that you would regularly receive at Holistic Chiropractic & Wellness. If spinal decompression is going to help you, you will feel some change within 8 sessions rather than pay and lock yourself into 24 sessions and a $5,000 contract. You can call Dr. Bob at (801) 230-0166 to schedule this complimentary evaluation or you can schedule on-line at www.drbobseiler.com. This would involve about 30-45 minutes of your time. We look forward in meeting and helping you! 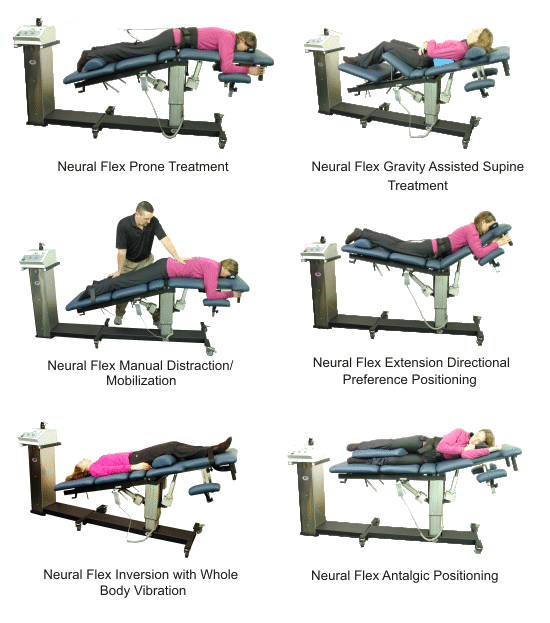 The illustrations below show the unique positions that your body can be placed on the Kennedy Decompression/Traction table to lessen your back, leg, neck, arm pain and the possibility of surgery.